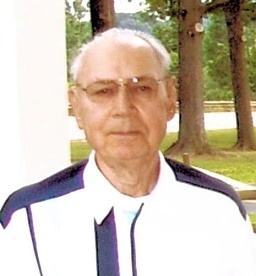 Donald E. Porter, 87, of Meadville, died peacefully at home, Thursday, August 07, 2014. He was born in Union Twp., Crawford Co., March 4, 1927 a son of Harry E. and Anna Stein Porter. He married Dorothy Smith June 29, 1947 and she survives. He was a veteran of World War II serving in the US Army in Europe. After returning from the war, he worked first at American Break Shoe, then Meadville Forging, then Shartle and Walker Construction Co. and finally for Jack Wasson and his construction company retiring in 1989. He was a member of St. Paul’s Reformed Church and West Mead Vol. Fire Dept. #1. In his retirement, he enjoyed doing various crafts. Survivors, in addition to his wife Dorothy of 67 years, include: a brother, Clifford E. Porter and his wife Shirley of Cambridge Springs; a sister-in-law, Betty Reichel of Meadville; four nieces, Patricia Hall and her husband Dan of Denver, PA, Joanne Anderton and her husband Joseph of Jamestown, PA, Nancy Braymer and her husband Charles of Orefield, PA and Patricia Turner and her husband John of Cambridge Springs; five nephews, David Porter and his wife Maria of Cambridge Springs, Jon Bowes and his wife Katey of Townville, Larry Porter and his wife Donna of Conneaut Lake, Terry Porter and his wife Beverly of Virginia and Gary Porter of Meadville and a few cousins. In addition to his parents, he was preceded in death by a brother, Rodney Porter and a sister, Arlene Porter Bowes. Calling hours will be Sunday from 2-5 p.m. at the Robert W. Waid Funeral Home, Inc., 581 Chestnut Street, Meadville. The funeral service will be Monday at 11 a.m. at the funeral home with the Rev. Joel DiAngi, officiating. Memorials may be made to St. Paul’s Reformed Church, 1070 Park Avenue, Meadville, PA 16335.